All of our fuel blends are straight replacements for ULSD diesel fuel that uses the same fuel storage, transportation and dispensing infrastructure and can be used in any diesel vehicles or equipment. The biodiesel in our blends has proven to prolong the life of diesel engines. The engines run quieter and cooler and require less maintenance due to biodiesel offering better lubricity and a higher cetane number. 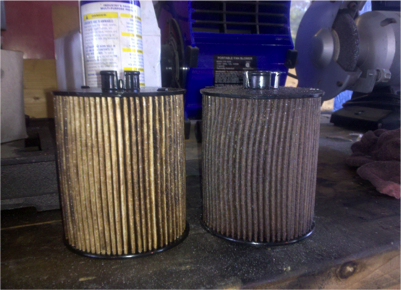 And because the biodiesel is an excellent solvent, it keeps the fuel system cleaner as well, note the image to the right of two air filters from two busses after 6 months of driving similar routes and miles. Further, biodiesel blends have been shown to increase gas mileage while reducing harmful emissions by 20% to 40% compared to diesel. Contact us today to learn more about our biodiesel blends and how they can save you money, improve performance and reduce the negative impacts of diesel-only alternatives.